What do you do when some idiot cuts you off on your drive to work? How about that putz who has been tailgating you for the past 10 miles? How about when your spouse always puts their wet towel on top of your towel and your towel is still wet the next morning (yes we use our towels more than once)? 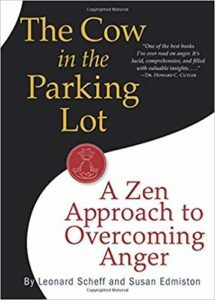 In Susan Edmiston and Leonard Scheff’s “Zen Approach to Overcoming Anger” you’ll get the tools to let go of those feelings by looking at the type of anger; Important and Reasonable (you want love from your partner); Reasonable but Unimportant (you didn’t get that seat in the restaurant window); Irrational (you want respect from a stranger); and the Impossible (you want someone to fix everything wrong in your life). This article was published on Feb 3, 2019 . It is tagged Leonard Scheff, Susan Edmiston, The Cow in the Parking Lot. You can follow any responses to this article through the comment RSS feed.